Vue.js is awesome. I’m telling this after having used React for more than a year in production software. I have written about my experience creating React SPA here. If you haven’t tried Vue yet, I highly recommend giving it a try. The developer experience is at the center. In this guide, we will see how to add Vue to a Rails project. So let’s get rolling. 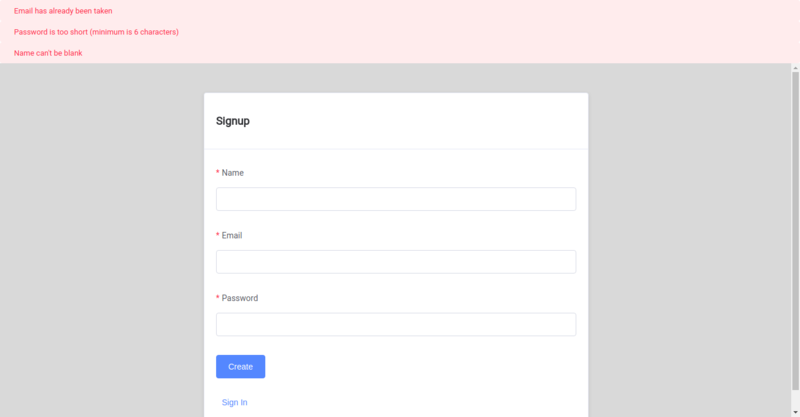 In this post, we are going to migrate our devise signup page to use Vue. I’ve chosen it after a lot of thought, as it will enable us to see a lot of power that Vue brings to the table. I’ll also use the Webpacker gem. This will allow me to use ES2015 syntax, Vue single file component and hot reloading. It’s ok if you don’t understand all of it. We will cover each topic in detail. First let us see how the end result will look like. Here are a few screenshots. I’ll assume that you have installed the Webpacker gem. If not here are the brief steps. The gem has very good documentation which you would want to refer for more details. So now that we are off doing our setup let’s do some real work. So now I expect that your tree structure matches what I’ve in the view above. I also believe you have generated your devise views to be modified. Below is the command on how you can generate it. We will now see code that will actually use Vue. I will try to annotate my source code for easy following.